Rarely does a book come out about a rock star that doesn't end in tragedy. Seldom are they autobiographies because who would be smart enough to diary their lives ... and their girls? You will think differently after reading "The Heroin Diaries." This isn't "Go Ask Alice" at all. Nikki Sixx has penned (in blood) his life as an addict, a rock star, a son and a survivor -- and not necessarily in that order. He isn't dishonest about anything and also not cocky about how he's dodged death. I recommend listening to "The Heroin Diaries" soundtrack or concept album (whichever one you want to call it) and then read the book. It will help you to understand where the songs came from but it will also gear you up for the retention you'll need to recall which part goes with each song. The book isn't a boring black-and-white story that you will keep spine out with all the other books on your shelf. I could say that it’s a graphic novel because of the drawn pictures and the splashes of red (blood) and the black (darkness) and white (hope) that fills each page. It also has plenty of pictures that feature Nikki Sixx along with various rocks stars and naked women. And if you buy this book for the naked pictures you're missing the whole point of the tale. Besides, no faces are shown and various black stripes block anything considered obscene. The whole point of this book is to tell a story, not a sad story and not a happy one either but a story of survival. 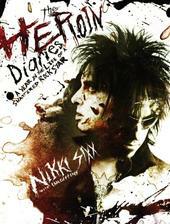 After you read this book you will see a different side of Nikki Sixx and catch but a glimpse into the life of a musician who came into this world with his middle finger in the air but after reading his story you'll find out he still raises it when it comes to defending his choice to live another day. There are plenty of people who give an introduction about Nikki Sixx, some you will know by their name, and others you will only know through Nikki. This book is a poignant look at the person who is the music, makes the music and eventually lives to write another chapter in his history of life. For more information, check out http://www.facebook.com/nikkisixxofficial. Revised: 29 Jan 2019 02:25:13 -0500.